Huge increases in wet weather grip and handling performance, ideal for year round riding. Improved levels of feedback from the contact patch thanks to a revised compound. Better braking performance thanks to revised tread layout for a safer ride. 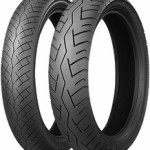 Revised tread grooves improve wet grip and wet braking, without compromising on the original Battlax T30′s superb dry road performance and durability. Re-engineered compound and pattern for a safe, comfortable and exhilarating ride. 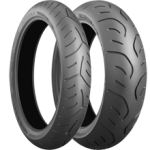 Sport tyre like levels performance, with the durability of a sport touring tyre. High levels of wet grip, accompanied by low noise, light handling and stable braking. 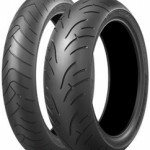 Low wear rates for long distance mileage, and 3 compound technology for increased grip when cornering. Different carcass construction on the BT-023 GT for larger touring bikes. SACT dual compound giving great wear resistance as well as boosting grip when leaning into a corner. 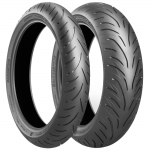 Silica rich compounds increase wet grip and rider feel when the tyre is cold. Comprehensive range of sizes in the UK’s favourite bias-ply tyre to cover virtually every possible fitment.